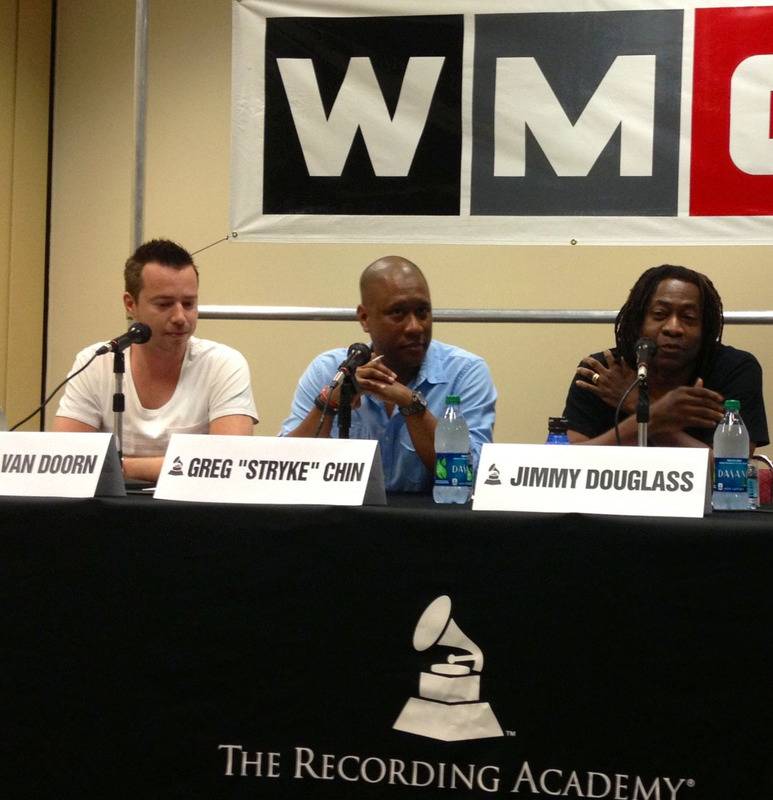 Pictured L-R: Renowned producer/remixer Sander van Doorn; artist/producer and panel moderator Greg "Stryke" Chin; and multi-GRAMMY® winning producer Jimmy Douglass. Photo Courtesy of The Recording Academy. © 2013. SANTA MONICA, Calif. (April 12, 2013) — On the afternoon of Wednesday, March 20, 2013, The Recording Academy® Florida Chapter and the Producers & Engineers Wing® presented the latest Producer's Forum at the Miami Beach Convention Center during the Winter Music Conference. Established in 1957, The Recording Academy is an organization of musicians, producers, engineers and recording professionals that is dedicated to improving the cultural condition and quality of life for music and its makers. Internationally known for the GRAMMY Awards — the preeminent peer-recognized award for musical excellence and the most credible brand in music — The Recording Academy is responsible for groundbreaking professional development, cultural enrichment, advocacy, education and human services programs. The Academy continues to focus on its mission of recognizing musical excellence, advocating for the well-being of music makers and ensuring music remains an indelible part of our culture. For more information about The Academy, please visit www.grammy.com. For breaking news and exclusive content, follow @TheGRAMMYs on Twitter, like "The GRAMMYs" on Facebook, and join The GRAMMYs' social communities on Foursquare, GetGlue, Google +, Instagram, Pinterest, Tumblr, and YouTube.